Japan take on Poland today knowing that a win will guarantee them a place in the last 16 of the World Cup. This final game of Group H will kick off at 6 pm local time. Speaking at the press conference on Wednesday Kawashima spoke alongside coach Nishino. Japan's number one seemed in confident mood despite his mistake against Senegal, as he remarked, "I want to help the team next." The goalkeeper continued by praising his teammates as he said, "My teammates helped me out against Senegal, this time I want to help the team." During the match with Senegal Kawashima made a few errors, one of these errors resulted in a goal for the Africans. Before this game, he had already been criticised for his performance against Colombia and this increased after the Senegal match. 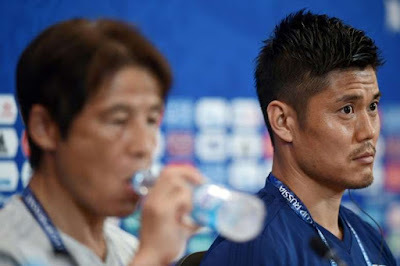 Despite this, he was in a defiant mood as he said: "I am in a position where I have to be prepared to be criticised while playing as Japan's number one." While it will be important against Poland for the Japan number one to keep a clean sheet. However, despite the mistakes in the previous two matches Kawashima and his coach both seem confident in his ability.